Many of us think about smart home products simply as a cool way to turn on the stereo, or how we can lower the AC without running over to the thermostat. But you can also use home automation devices to secure your valuables, prevent break-ins, and keep your family safer. Door and window sensors, automatic locks, and alarms all protect your home through motion detection and predictive technology. But with so many products available on the market, selecting the best tool for your needs and budget (not to mention hub and phone compatibility!) can get overwhelming fast. To help you figure it out, we put together this list of the best smart devices to secure your windows—so you can get back to enjoying your life! Professional home security companies, like ADT and Vivant, have finally started to jump on the home automation trend. For instance, ADT recently partnered with tech giant LG to produce its own smart device and integrate third-party devices like Nest. Typically, these security services include several bundled products such as a streaming cameras, motion sensors, lights, and automated locks. They charge a monthly fee that will run you somewhere between $30 to $40. Your contract typically lasts two years, with penalties for early cancellation. On the plus side, however, you have a security professional at your disposal to install and maintain your system. And an emergency alert connects you directly with services in the event of an intruder. That makes it a nice option for those of us who struggle a bit with home technology. On the other hand, DIY systems like a personal security kit let you monitor activity yourself using alerts sent directly to a phone or control panel. Of course, DIY means that you may have to figure out a lot of the set up on your own. And it’s up to you to alert the authorities in the event of an emergency. On the other hand, once you have the system configured, you don’t have to pay for anything else. Andersen, a popular windows manufacturer, recently teamed up with leading smart home providers to offer security monitors, locks, and sensors designed exclusively to work with their windows and patio doors. 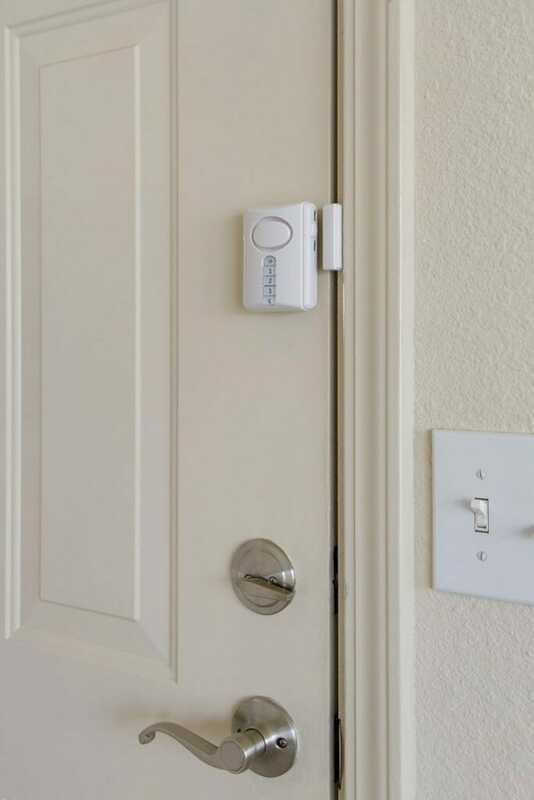 Z-Wave-connected window locks and open/close sensors alert you when a window is cracked or left ajar. They also indicate whether or not locks are fastened. The hardware integrates with several professional monitoring services, including ADT and Honeywell. But you can also combine it at no additional charge to a Wink hub or Nexia for a DIY solution. If you don’t want to go through a professional service, however, you must purchase a separate Andersen translator and bridge that can interpret window signals for smart home devices. From there, you can monitor your windows yourself using your tablet or phone. Install these yourself on your existing Andersen windows, or integrate them when you purchase new windows for a window replacement project. If you don’t care to go the way of self-monitoring, Vivant Sky makes an excellent choice. Theirs is a bundled system, but you can add as many or as few features as you like. And that includes several devices built specifically for windows, like sensors and glass-breakage detectors that alert a monitoring service directly in the event of an intruder. Vivant manufactures a wide selection of additional security products, such as automated door locks, motion detectors, garage door controls, and doorbell cameras. But they also offer other products, like CO2 monitors and smart thermostats, which can be rolled in with security systems and manipulated from the same control panel, or via the Vivant app on your phone. And their system pairs with Amazon Echo, Nest, and Element thermostats. If you prefer your gadgets ad hoc, separate window sensor devices, like those manufactured by Ecolink, communicate with almost any Z-wave network. 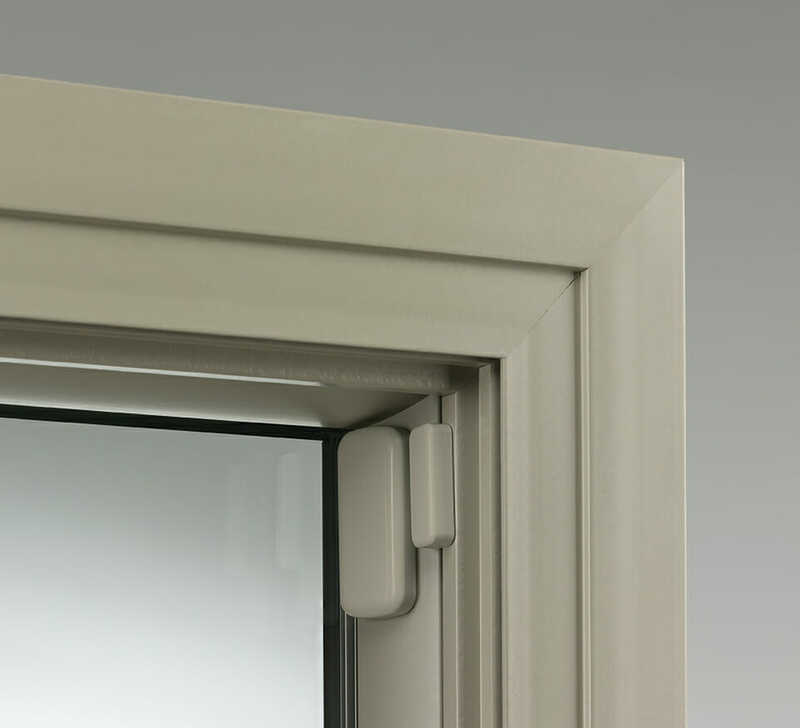 The magnetic sensors sit between the frame and the window to alert homeowners when someone opens the window. Installation takes little effort and requires no drilling or specialized mounting devices. Compatible with SmartThings, Staples Connect, Vera, HomeSeer, Nexia and Piper, Ecolink pairs easily with a wide variety of home automation hubs. Window open and close sensors definitely help you feel more secure in one way. Of course, many burglars simply shatter the glass and reach right in. So a glass break detector, such as this one offered by Honeywell, can really help keep you safe. The wireless device integrates with other Honeywell security products, like alarms, smoke detectors, and motion sensors. Because of an improved pitch detection system, this alert emits fewer false alarms than its predecessors. It also works on windows with security film installed. A bundled security kit makes a great option if you want to DIY but don’t care to deal with purchasing a bunch of individual sensors and devices yourself. GE’s Personal Security Alarm Kit comes with a selection of battery-powered window alarms and a deluxe door alarm that can be armed or disarmed with a four-digit pin. GE claims that the wireless nature of the system makes it intuitive and easy to install, meaning it offers a suitable solution for those uncomfortable with technology and programming. The alarm, once triggered, sounds a 120-decibel siren, which makes it virtually impossible to ignore. Smart home products allow you to take control of your family’s safety like never before. With a range of different products at your disposal, your home security is truly in your own hands!